Vegetables and fruit storage 1: impossible to store 100%??? So 2 times I tried to store more vegetables. First cabbages and now tomatoes. Looking at the capacity from the 100% I used 39%. So I should have space for 61% tomatoes... yet I can't seem to store them. Load, yes but store not a option. Sure I can sell, but I like to have my storages at 100% and sell the rest. So that I have back up to sell when the price is right... investment in the future, sort of speak. Should we tag the Community Manager with bug reports/finds??? Or just create a support ticket after posting here? Can't seem to find the forum etiquette. I also usually store my fruit & veg before selling now and have found the drop option to be a bit finicky. I'm usually using 3 trailers in a train which makes it worse trying to line up the right trailer for the drop, often I have to drive away and then back around to the storage a couple of times to get it to work. 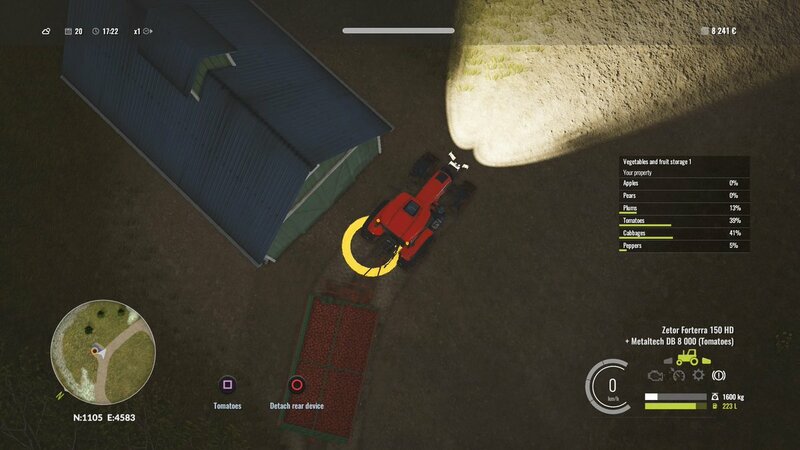 You attach a good example of the problem - the option to drop or add tomatoes should be coming up when the trailer is over the yellow halo not when the tractor is, but the game doesn't work like this. Yeah, it's a bit of a trial and error to load/unload trailers. I have found out (hard way) that I want to load plums in a trailer train they load in the back trailer first. Also If I want to detach the trailers it should be nice to have the option to detach only the first and keep the train with the others. The authentic farming experience is in there! I see a lot good things but not (yet) farmer friendly. Are the developers reading these forums, @James Gallagher? Could it be that the storage count's everything? If I look at my percentages I have 98% used... If that's the case I hope this is some sort of bug. This is just not practical. I almost have enough veg stored to test out your theory but I’ve taken a break from that mode due to the constant crashes - seems to have got worse. Doing the challenges instead. Seems your hunch is correct - I was just tipping into the store and it stopped halfway through. Total of percentages across the veg types, 99%. More realistic this way but not what you'd expect.